Two years ago, I spent a lot of time exploring the rooftop squatter villages that spread across the city like mushrooms on a tree stump. There’s an eerie feeling that comes over you as you walk through these settlements. Weeds poke through cracks in concrete walls; birds chirp and cicadas whir in the hot summer sun. It’s as though you’re in an isolated country village, except when you look down, water pipes run along the path in front of you, and when you look to the side, you see a forest of highrises. The nearest street is ten stories below. Inspired by this very feeling, a young German filmmaker named Marco Sparmberg has created Squattertown, a new mini-series based on a dystopian vision of Hong Kong. 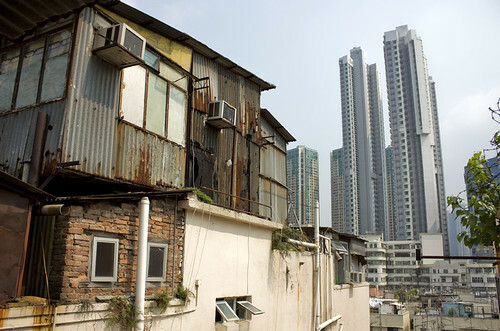 In this parallel universe, the wealth gap has grown so large, a vast underclass is forced to live in a ramshackle, parallel city that exists above the heads of the affluent. Threatened by this sprawling rooftop shantytown, the wealthy from below send up a thug to terrorize the leader of the roof society. It’s what Sparmberg calls a “Dim Sum Western,” a new genre that draws from the genre-redefining syncretism of two hallmark film movements: the Spaghetti Westerns of the 1960s and the Hong Kong New Wave of the 1980s. The scenario is fantasy, but like any good allegory, it’s not too far removed from reality. “I was trying to tackle the issue of property developers trying to push out people by any means, especially those people in rooftop housing,” said Sparmberg when I met him on the roof of the Jockey Club Creative Arts Centre. Last fall, he spent two months scouting rooftops that would be good for shooting. 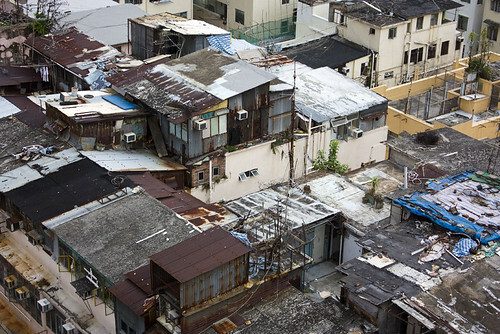 He found most of them on buildings slated for redevelopment by property developers and the Urban Renewal Authority. While Sparmberg and his crew had the support of roof dwellers, they weren’t able to get permission from the property management companies, who would refer them to the URA, which usually referred them back to the managers. They had no choice but to shoot guerilla-style. “You have guards patrolling the buildings, so I checked their patrolling schedules and when it was time for them to come up to the roof, we went back down, had a coffee, took a break,” said Sparmberg. It was well worth it. To anyone familiar with Hong Kong, the series’ shantytown aesthetic is instantly familiar, and Squattertown captures the uncanny feeling of being in a faraway village suspended high above the street. In fact, for one scene that involved too many crew and actors to take up to the roof, Sparmberg filmed in the old fishing village of Lei Yue Mun, whose hodgepodge appearance mirrored that of the rooftops. Some of the locations that Squattertown used for shooting last fall have already been demolished. One was partly destroyed by a suspicious fire that killed one of the rooftop inhabitants. A rooftop village in Tai Kok Tsui. The entire building is now empty and slated for demolition. Squattertown will be released online and through a mobile app next month. Sparmberg told me he hopes to have a rooftop premiere — maybe at the JCCAC, whose founding director envisioned rooftop film screenings when it opened three years ago. It’s hard to say whether that will be possible given the centre’s reputation for red tape. Beyond its use of rooftop locations, Squattertown is also interesting for the innovative way in which it was financed. You can read more in the CNNGo article I wrote about the series — just skip to the sidebar at the bottom of the page. 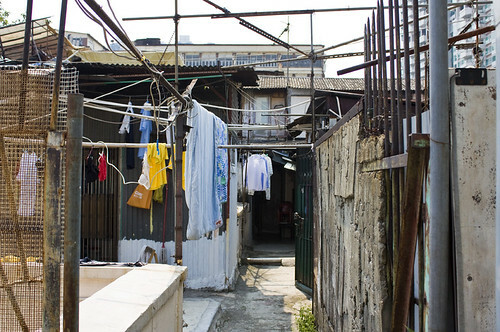 This entry was written by Christopher DeWolf , posted on Tuesday May 31 2011at 12:05 am , filed under Asia Pacific, Film, Heritage and Preservation, Interior Space, Society and Culture, Video and tagged Hong Kong, Informal Settlements, Informal Space, Kowloon, Rooftops, Squatters . Bookmark the permalink . Post a comment below or leave a trackback: Trackback URL. What is it with German filmmakers and Hong Kong’s informal settlements? Your comment that, “like any good allegory, it’s not too far removed from reality” reminded me of the French sci-fi film Banlieue 13, set in a dystopian and anarchic future version of Paris’ suburban ghettoes (and getting a bit further afield from reality, the allegorical alien township outside Johannesburg in the more recent blockbuster District 9).